Ireland is a long way from Seattle. We left Seattle around noon on Sunday, flew to Atlanta (6 hours in the air), and from Atlanta on to Dublin (8 hours in the air) and arrived at 10:30 am Monday morning pretty wiped out. Coming back was worse. From the time we left our hotel in Dublin to the time we arrived home in Bellevue it was a 23 hour day, 15 hours of which were spent in airplanes and the rest in airports or taxis. Still, it was an excellent trip! Ireland is beautiful, the people are friendly and helpful, and it is all interesting. We weren't the only tourists in town. You could hear a lot of Italian, Spanish, Greek, French, and Portugese, and to a lesser extent, Romanian, Polish, Russian, Urdu, Tagalog, Dutch, Slovakian, and some that were hard to identify. People from hot Mediterranean countries were probably there for the climate as much as anything else. It's 100 degrees in Madrid and 60 degrees in Dublin. Not a hard choice. 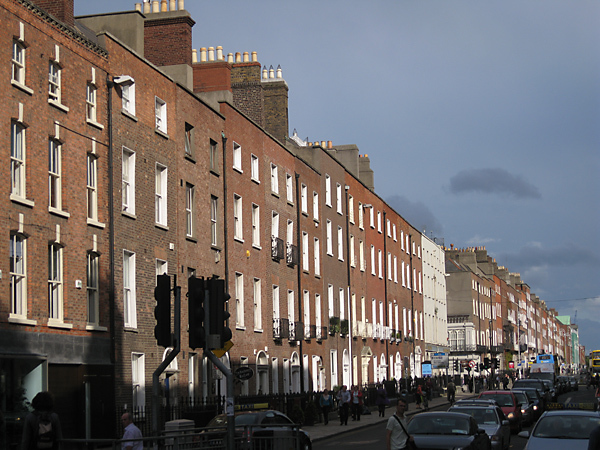 Here is a picture of a street in the Temple Bar area. 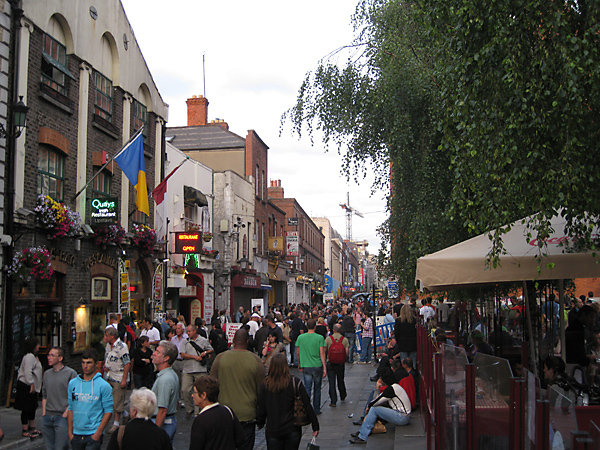 Temple Bar has a lot of pubs, restaurants, shops, and street performers. 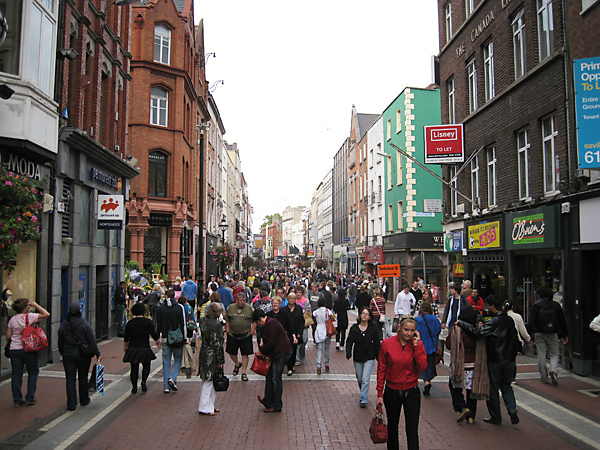 Grafton Street, pictured below, was the premier shopping area in the city. It had shops, pubs, restaurants, and street performers. 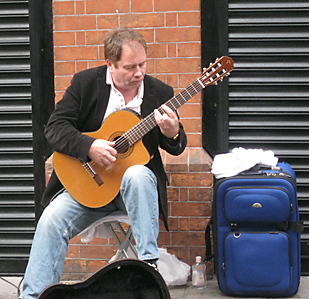 This street performer played an excellent classical guitar. 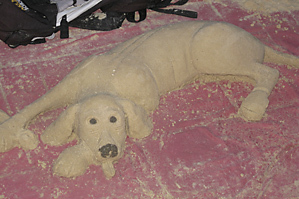 There were also violinists, solo electric guitar players, bands playing rock, bands playing traditional Irish music, flute and guitar, sidewalk chalk painters, sidewalk chalk poets, acrobats, human statues, and sand sculpters (well, one sand sculpter -- he did a very fine dog on a piece of canvas). All had a hat or a can or an open guitar case ready for contributions to the cause of art. Not all in the polyglot crowds were tourists, of course. We heard a British commedian on TV make the following comment: England is home to the most diligent, hard-working, and skilled work force in the world -- the Poles. He could also have been talking about Ireland. Lots of foreign nationals there as well. 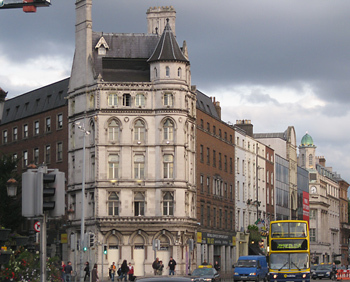 A lot of the architecture of Dublin was quite interesting. 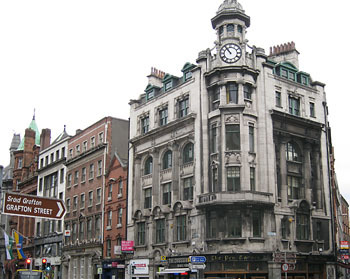 There is a fair bit of Victorian architecture, which tends to be a bit ornate. 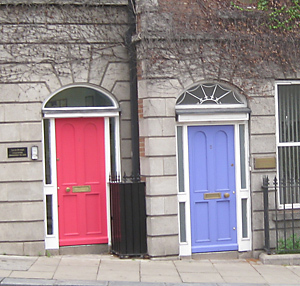 The doors are of particular interest, with varying colors, pillars, door knockers, door knobs, and fanlights (semicircular or semielliptical windows above a door, usually inset with radiating glazing bars.) 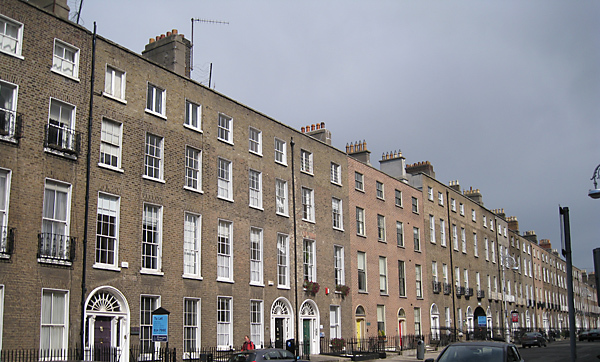 Before houses were numbered in Dublin (after the 1851 house census) details of the door were used to distinguish the various abodes in the blocks of near uniform buildings. 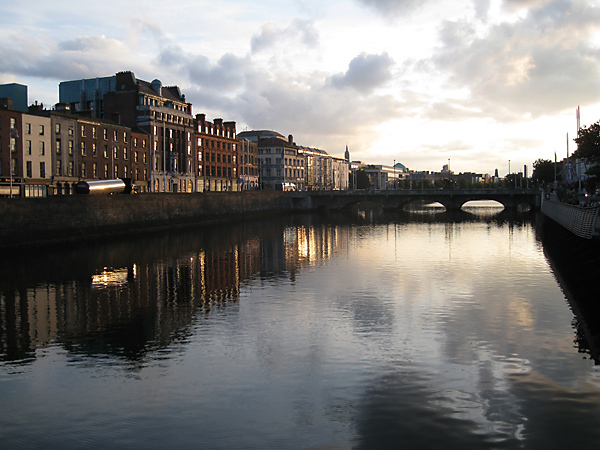 The river Liffey runs through Dublin, dividing it into the North side and the South side. 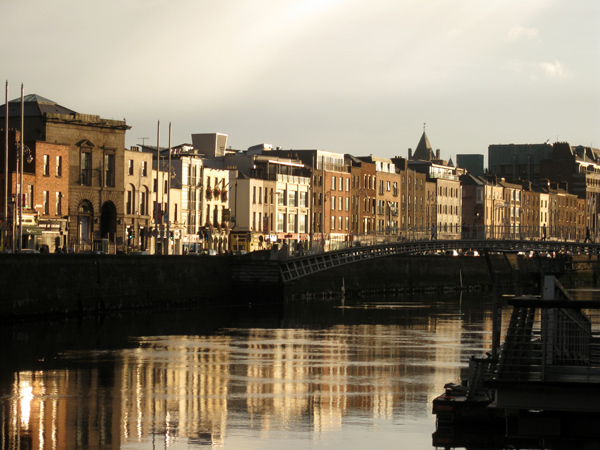 Liffey rhymes with iffy. Nice to walk beside in the evening, away from the noisier areas. If you get lost, you can just ask someone to point you to the river. We took a train from Dublin to Cork. 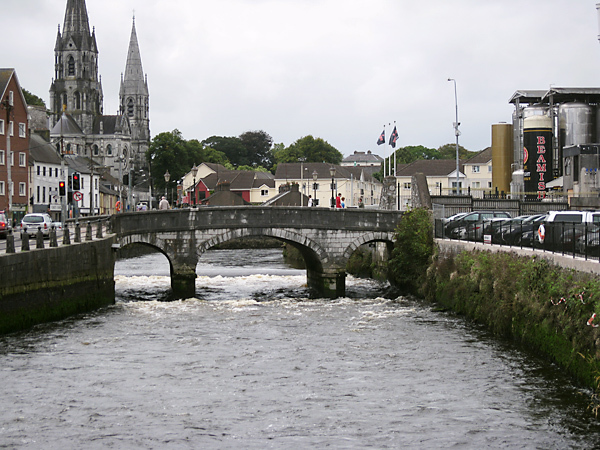 Central Cork is an island in the river Lee. 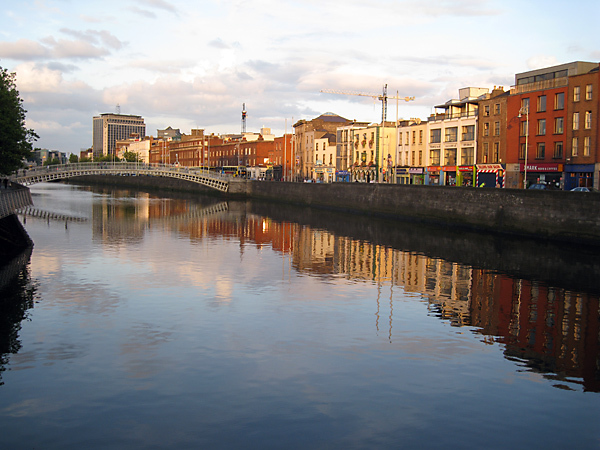 It is the 2nd largest city in Ireland (excluding Belfast in Northern Ireland) but a lot smaller than Dublin. 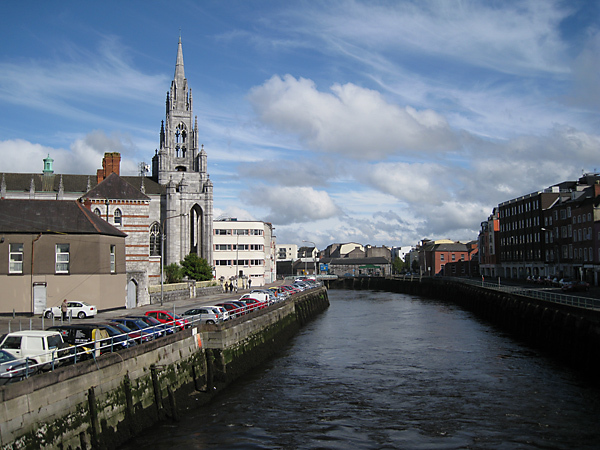 Here are some pictures of Cork. The day we arrived the Tour of Ireland bike race was finishing up in the city. 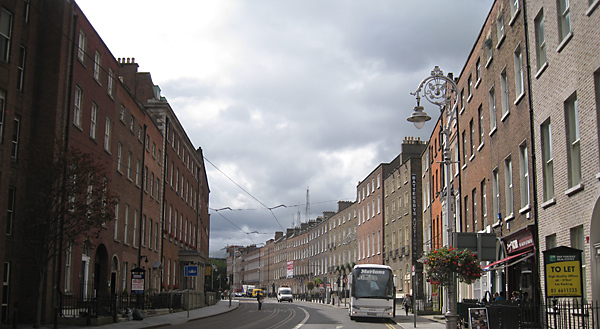 The last leg was up St. Patrick Street Hill. Lance Armstrong was in the race, but pulled out before the final hill. It was pouring rain and the newspaper said that water ran down the hill in a steady stream. 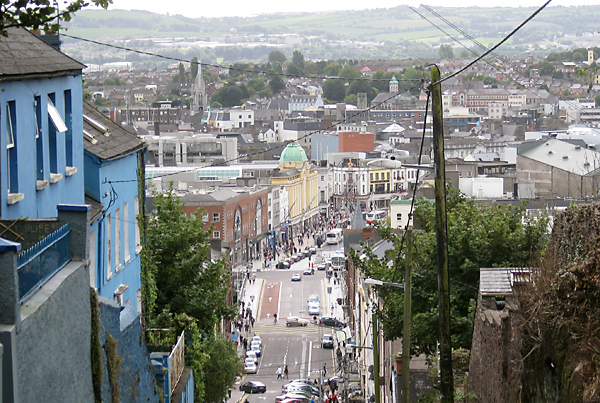 Here is a picture of central Cork taken from the hill on St. Patrick St. 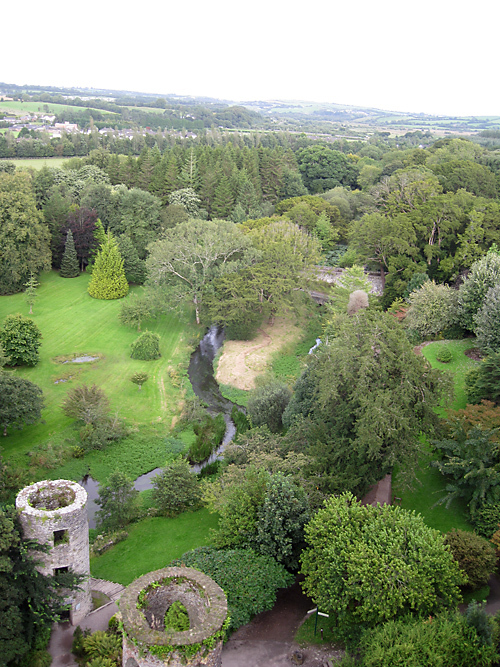 The famous town of Blarney is half an hour's bus ride from Cork. 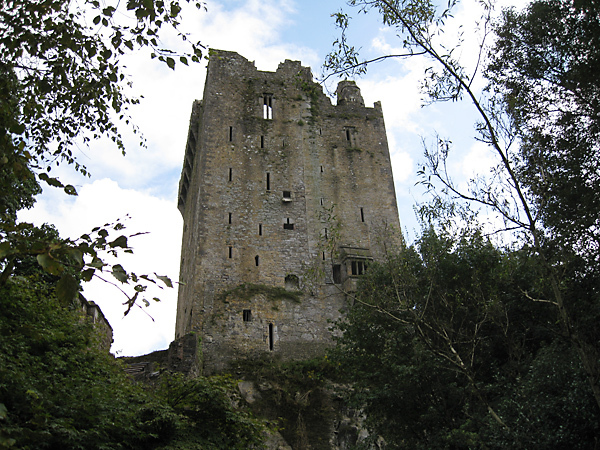 Blarney is home to Blarney Castle. The Castle has seen better days, like in the 15th and 16th centuries. 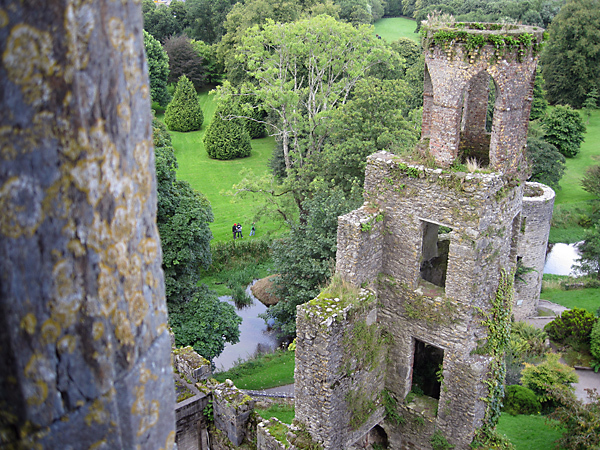 To get to the top, you climb a narrow spiral staircase of stone that looks like the rest of the stones in the ruin. There is a rope along the center of the spiral. Grab hold and don't look down as you climb. Here is the view from the top. 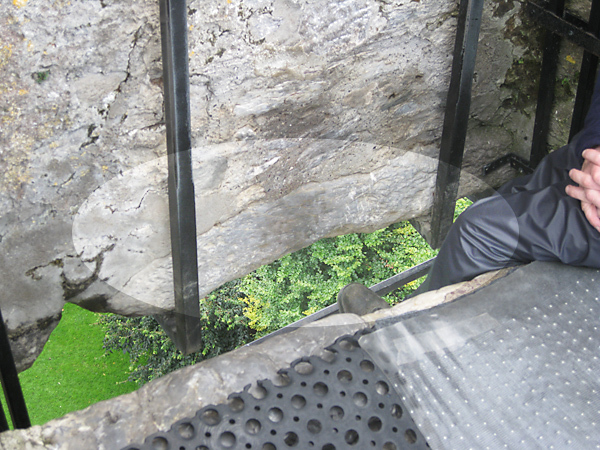 At the top is the crown jewel of Blarney Castle --the Blarney Stone, highlighted below in context followed by a close-up shot. 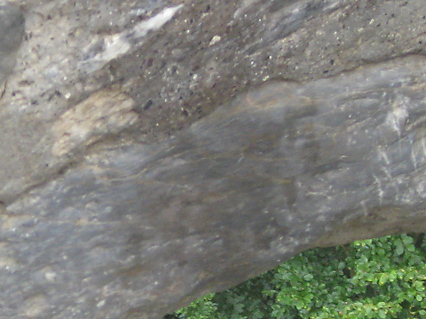 Kiss the stone and you'll get the gift of eloquence, the legend says. You lie on your back, scoot stone-ward, lean your head all the way back, pucker up, and kiss the rock while your head is upside down. Churchill evidently kissed it early in his career. We declined. 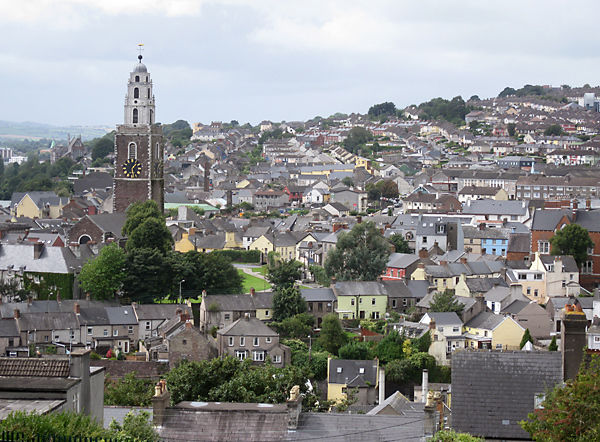 About an hours bus ride from Cork, Kinsale is a little picturesque port town. A lady in a restaurant who was very friendly and very helpful suggested we make a day trip there. The highlight of that day was a tour of Charles Fort, which dates from 1677. 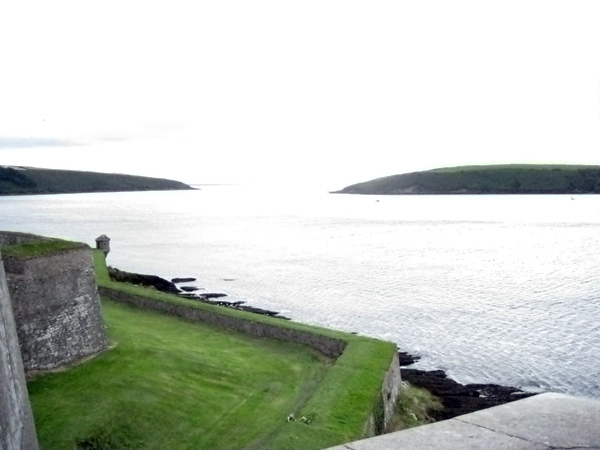 The fort guards the entrance to Kinsale harbour. It was built to protect the area and specifically the harbour from use by the French and Spanish in the event of a landing in Ireland. The tour guide, Jeremiah Hurley, was an exceptional fount of information about the history of the fort, the history of Ireland, the military tactics and strategies of the day, and military technology in general. 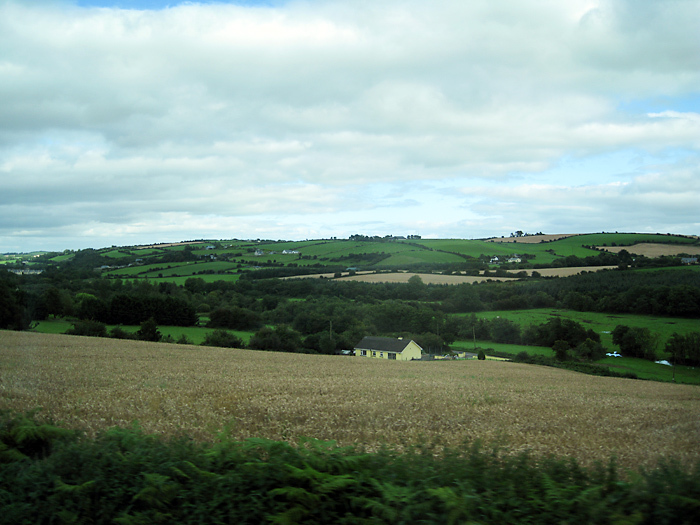 Here's a picture of the Irish countryside taken from the bus on the way back from Kinsale to Cork.